It was a dreamy weekend for Penkse team, thanks to the first and second positions of Castroneves and Power in Race 2 in Detroit. 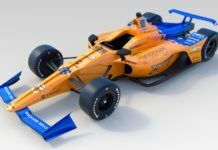 Kimball was third and Hunter-Reay had to retire in a race with many problems for the American, who drops to third in the championship that now leads Power with nineteen points over Castroneves. Race 2 in Detroit at Belle Isle began with the rolling start where Sato and Hinchcliffe, front row, provoked abortion as they were insufficiently together. Once the start was done correctly Sato led followed by Castroneves, Hinchcliffe, Briscoe and Muñoz. But in the third curve while Power overtook aggressively Newgarden made him, Rahal and Wilson stay blocked. Kimball also affected could continue. This caused the first yellow flag and the first pace car of the race. 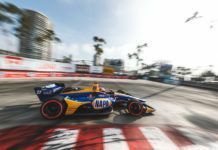 Power, Andretti, Dixon, Hunter- Reay, Wilson, Newgarden and others took advantage of the situation to pit and put the hard tyres on. The race was restarted on lap five with a certain quietness although Power took advantage of the situation and overtook Hawksworth, placing himself thirteenth. Then he would do the same action with his teammate Juan Pablo Montoya. Just after making this movement, Power was penalized for the contact with Newsgarden in the start. Castroneves lost second place to the overtake by Hinchcliffe during the ninth lap and then Conway would advance him using hard tyres. This indicated that the rate of Castroneves was not too good, namely a second slower per lap. Then Saavedra caused the second yellow flag of the race while hitting the protections of turn seven and breaking the left front suspension of his car. This would be used by Sato, Castroneves, Briscoe, Montoya, Hunter-Reay and Newgarden to make another stop and re-equip the hard tyres. Hinchcliffe was going to lead the race with Conway, Muñoz, Pagenaud and Huertas behind. With the lap fourteen green flag went back tothe track; Hinchcliffe was still leading but his soft tyres had no longer grip and Mike Conway got close to him with his hard tyres to fight for the first position. The Canadian pace was becoming significant and Muñoz was already reaching them. 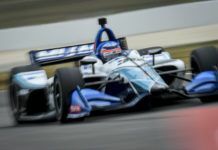 Right after Hinchcliffe equaled the laps led with Sato, Conway surpassed him turn three and with less than a lap he had already secured three seconds away, forcing the driver of Andretti Autosport together with his teammate to pit. 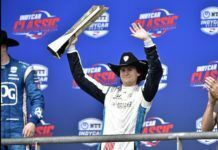 Conway got the fastest lap being eight tenths per lap faster than Pagenaud and Huertas, pressured by Aleshin – a struggle that could experience last year in the Formula Renault 3.5 Series. Pagenaud and Huertas pitted on lap twenty-three and Conway got away eleven seconds from Power – who had already made ​​his pit stop. Enough gap for Conway to pit on lap twenty-five, equipping the soft tyres unlike all the rest with hards in their cars. Two laps later Power came to make his second stop and Penske came to track with a new set of hard tyres, leaving behind Conway. Castroneves went on to lead the race with a pace similar to Conway, virtual race leader. The fight appeared to be between Castroneves and Conway. The South American was making his second stop during the thirty third lap shoeing hard tyres on his Penske. Castroneves was leading in mid-race followed by Conway, Hunter- Reay, Power and Pagenaud. Then Sato, Briscoe and Hawksworth suffered a contact that caused the spin from AJ Foty. In the front Castroneves was a half second per lap faster than Conway, who suffered a lot with the soft compounds. Hunter- Reay also had problems but in this case these were fuel problems and he lost many positions. The same happened to Conway but with the tyres. The British lost a lots of positions during lap 39 when he decided to stop and put hard tyres on. Presumably his crew chief, Ed Carpenter expected some other yellow flag but this plan failed and destroyed the chances of victory of Conway. 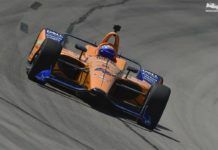 Leaving both Penskes first, Pagenaud, Hinchcliffe and Dixon – who started from last position – followed them. Hinchcliffe made his second stop on lap 45m and in the next one did Pagenaud, both with hards on. Three laps later came the key moment of the race: the two Penske stopped to pit and Conway did the same. The maneuver was so perfect that they were still leading the race after the stop; Dixon was third followed by Kimball and Pagenaud. On the other hand Rahal had a little contact with the wall that would diminish his pace and finally force him to abandon the race. With fifteen laps to finish and Castroneves controlling the race, Power began to cut adistance to the South American and three laps later, and after having a race with almost no cautions, Bourdais hit against the protections in turn five. Meanwhile; with 9 laps to go, Hunter-Reay finally retired due to electrical problems. With seven laps to finish, the restart opened a small race with everyone going for all or nothing. Hinchcliffe overtook Pagenaud for fifth place and Kimball did the same to Dixon, in order to fight for the podium. 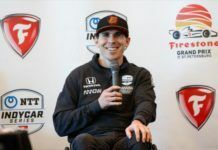 The reigning Indycar champion complained that the thing was not normal when Hinchcliffe had beaten him. But the Ganassi driver could breathe easily after seeing how Sato crashed in the same place where Bourdais did, this was Marco Andretti’s fault, who would be later penalized by the movement. A disaster weekend for Sato after taking pole position this morning. Castroneves, Power, Kimball, Hinchcliffe and Dixon were in the TOP5 with only three exciting laps to go. The Penske escaped from the rest, and the other drivers were fighting for places from third to sixth. In the last lap Hinchcliffe tried to be on podium but Kimball closed him that door. To make things worse Andretti Autosport driver lost fourth place, Dixon took his place. 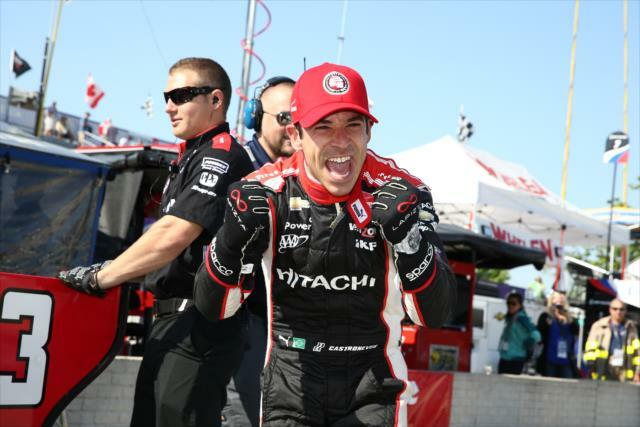 Now the Penske team complete an incredile weekend after this 1-2, and also with the double in the championship, led by Power with 325 points, Castroneves is second 19 points behind, and Hinchcliffe third with 26 less points than the leader..